It’s known as the music industry’s biggest night. The 61st Grammy Awards celebrated music but also highlighted mental health advocacy, the power of womanhood, and following your dreams. Singer and songwriter Alicia Keys hosted the ceremony. The Grammy Award winner is the first woman to host the show in over a decade. Throughout the night, she spoke about musical expressions and the women who make positive world impacts. Some of those women appeared within the first five minutes of the show. Keys brought out Lady Gaga, Jada Pinkett-Smith, Jennifer Lopez, and Former First Lady Michelle Obama. “Music shows us that all of it matters. Every story within every voice and also every voice within every song,” said The Former First Lady. But music’s biggest night wouldn’t be complete without performances. Notable performances include Janelle Monae who rocked the stage with songs from her latest album Dirty Computer. Lady Gaga belted out her Grammy winning song Shallow. And Travis Scott performed songs from his critically acclaimed album Astroworld. 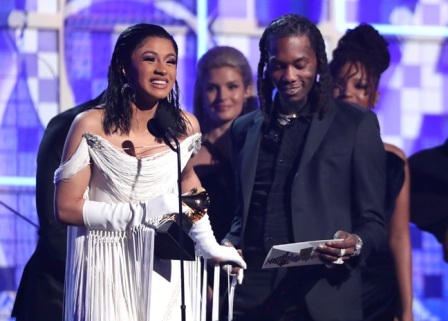 All eyes were on New York rapper Cardi B. The honest and sometimes controversial rapper performed her latest single Money. She also snagged her first Grammy award for Best Rap Album. This makes her the first female rapper to receive the award. Many performances were praised but one caused quite a stir online. Before she performed, Jennifer Lopez received backlash for performing the Motown Records medley. The Motown performance celebrated the rich black history of the label’s legacy. Some viewers felt the Grammys should’ve chosen black artists instead of Lopez. 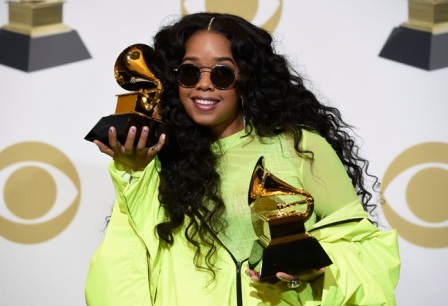 Once noticeable Grammy winner was singer H.E.R who took home two awards. With her silky smooth vocals and powerhouse performances, H.E.R has already proved her longevity within the industry. While winning her award for best R&B album, she thanked everyone who supported her even with an EP album. Despite not winning her own Grammy, Diana Ross was honored for her decades of musical influence and accomplishments. The Motown legend performed some of her biggest songs while also celebrating her birthday. Performances weren’t the only center of attention. Artists who won spoke out on important issues. Lady Gaga told the crowd about the importance of mental health. She urged everyone to seek help if they felt depressed or anxiety ridden. 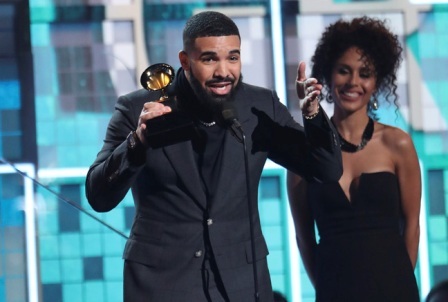 Drake made a surprise appearance and took home the “Best Rap Song” award. Before accepting the award, he told the crowd winning awards shouldn’t impact an artist’s creativity. “You’ve already won if you have people who are singing your songs word for word or if you are a hero in your own town. You don’t need this right here, I promise you,” Drake told to the millions of viewers watching. His microphone was abruptly cut off after that statement. A Grammy Spokesperson later clarified that producers thought he was finished.